Remember the heady days when national pride and colours defined the appearance of racing cars, not sponsorship deals worth tens of millions of pounds? The Historic Grand Prix Cars Association does. Indeed, since 1979 its members have striven passionately to preserve the heritage of the titanic machines (and their courageous drivers) which made motor racing history at the highest level when it was a sport, not a commercial circus. Our story revisits the great rivalries of five decades, spanning artisan-crafted two-seater Bugattis of the 1920s to the exquisite 1.5-litre ‘cigar tubes’ of 1961-’65. It also replays the inter-marque battles between cars with supercharged and naturally-aspirated engines at the birth of the Formula One World Championship in 1950, and its subsequent 2.5-litre era which saw the naissance of new-fangled chassis with engines behind their drivers - an advance pioneered by Auto Union pre-war. In celebrating history and technical innovation, and educating new generations of motor racing fans about the past, we also focus on the heroic driving of William Grover Williams, Tazio Nuvolari, Giuseppe Farina, Alberto Ascari, Juan Manuel Fangio, Stirling Moss, Mike Hawthorn, Jack Brabham, the Hills (Phil and Graham), Jim Clark and John Surtees in Grands Prix often fought out over three hours. Each golden era’s glories are celebrated on spectacular Pre-1961 and Pre-1966 grids at dedicated historic race meetings. 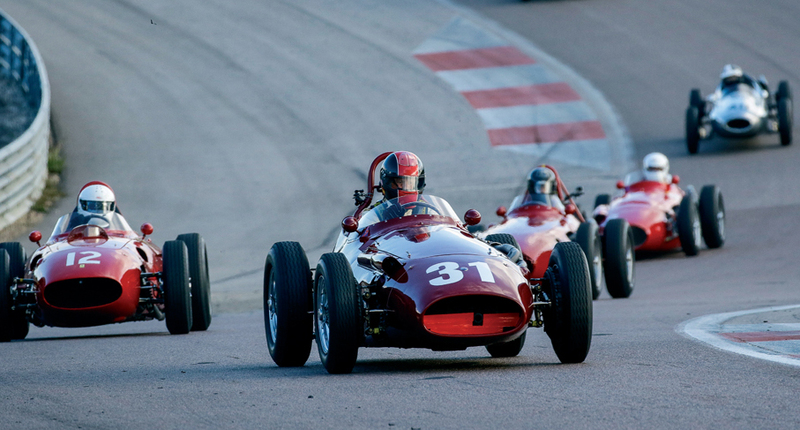 Join us at Great Britain and Europe’s most famous Grand Prix circuits to be magically transported back in time in an evocative blur of Italian scarlet, British Racing Green and French blue. Welcome to the HGPCA’s fast-moving history book.